Replacing a roof is one of the most expensive home repairs, and most homeowners have to do it every 20 years or so -- unless they have a metal roof. 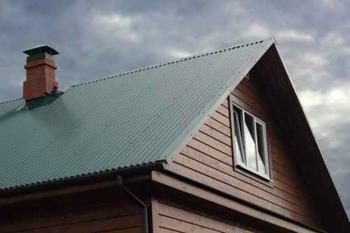 Opting for metal over other types of roofing comes with a wide range of benefits, and now there’s one more. Homeowners who add a metal roof to their primary residence (or who did so in 2015) are eligible for a $500 tax credit. Why else might you consider making the switch to metal? The tax credit is a nice incentive, but it seems homeowners were on board with metal roofing even before it offered a literal payoff. Metal roofing has seen a dramatic rise in popularity over the past decade; it’s now the second most popular re-roofing product in the U.S.
Its rise to the top has been for good reason. It is a durable and long lasting material that is energy-efficient, fire-resistant, and can be installed quickly. Metal roofs can also help you save on cooling bills. On hot, sunny days, the eco-friendly covering can reflect heat away from the house. During other seasons, its ability to shed water and snow will benefit homeowners. If you're sold on metal and want to install it, the next question will be which type of metal to use. There are a few different types of metal to choose from, but most people go for steel or aluminum. Homeowners are smitten with these roofing materials because they’re economical, durable, and hold paint finishes well. Aluminum comes with downsides, however. It’s a little more expensive and more susceptible to damage than steel. (It’s a soft metal that may dent more easily.) But it does beat steel in one category: aluminum won’t corrode the way steel can. Considering making the switch to metal? Check out the Metal Roofing Alliance’s website to see which roofs qualify for the tax credit. From there, just ask your contractor to provide a copy of the Manufacturer Certification Statement. You'll need it when you file your taxes, along with IRS Form 5695.